From the back: America has fallen. A vampiric scourge sweeps the nation, turning brother on brother and parent on child as the blood-hungry beasts take deeper and deeper hold upon the land. It's hard for the survivors to know whether to be more afraid of the creatures themselves or the violent religious groups that have sprung up in response, but there is clearly only one choice: fight or die. That virginal synopsis is the best way to enter Stake Land as did I last night. But just for a little more fill-in, the nation has indeed been overthrown from within by an unexplained plague that has turned millions into raging, bloodthirsty lunatics by night. Top figureheads have abandoned their offices, dangerous religious sects have blanketed rural areas, and most everyone that hasn't grown fangs is trying to head north to a place dubbed "New Eden" for its anti-vamp cold climate. We're tagging along through the narrative of a teenager named Martin (Connor Paolo) and his battle-hardened caretaker Mister (Nick Damici) as the pair encounter threats from both the living and undead. 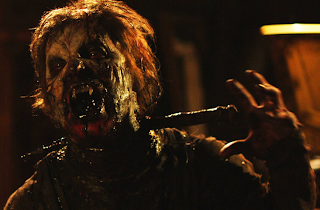 In short, this is what George A. Romero's wishy-washy 2005 return, Land of the Dead, should have been (minus the fangs, of course). A well-measured, pensive study of an America with its society in shambles where discovering a trashed motorhome in the woods miles away from anything can provide immeasurable solace. A post-apocalyptic film with enough confidence and seriousness to make you believe in its continually retrograde world through more tell than show. Okay, so maybe I'm also describing Romero's prime work along with Stake Land, but you get my drift. 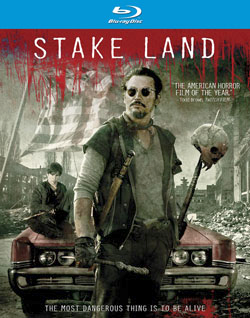 As for rough patches, not wanting to go into spoiler territory, there is a pivotal battle late in Stake Land that gets too hokey and somehow feels wrongly reminiscent of del Toro's Blade 2. Still, it's small bump in a promising answer to those, like myself, who constantly bemoan modern horror for too often devolving into self parody and laziness. It's horror that wants to earn your respect first instead of automatically expecting it. That's enough right there to garner high recommendation. A sequel is clearly set-up and hopefully we'll eventually see one. Dark Sky Films is only getting better with their Blu-ray output. The 1080p, MPEG-4 AVC-encoded 2.39:1 widescreen transfer is excellent. Stake Land was shot in 4K using the RED camera system, and despite the high resolution, sometimes the result can look rather muddy and flat on Blu-ray (Skyline for example). There is a smoothness to the presentation, but it never looks off-putting even with obvious color grading in post-production. Again like other Dark Sky BDs, the back only bears a Dolby 5.1 logo while the disc instead features fantastic lossless DTS-HD MA 5.1 and PCM Stereo audio tracks. I'm not a supplement hound so I yet haven't checked out the two commentaries, hour long making-of by Eric Stanze, video production diaries, and seven short film prequels from an assortment of filmmakers (available on Glass Eye Pix's YouTube channel). Fantastic. I just ordered a copy based on your review. I basically waited until I read a solid review written by someone who's taste I respect. Trailer looked dope, so i'm glad film is. So many films disappoint with perceived potential. Glad this one doesn't. Re: "Slashers: Why The Bad Rap?"